Update January 11: In a press conference at the 2018 Consumer Electronics Show Monday, Mobileye co-founder and CEO Amnon Shashua said that with SAIC, Mobileye's chips were installed in the vehicles of 15 Chinese manufacturers, out of 27 global manufacturers in total. Among the names mentioned were Baoding, China-headquartered Great Wall Motors Company Ltd., state-owned Dongfeng Motor Corporation and Shanghai General Motors. Mr. Shashua also said that in 2017 Mobileye sold 8.7 million of its system-on-chip devices, EyeQ, meaning their chips are now installed in 24 million cars since they were first introduced into the market in 2014. The company intends to start the serial production of the next generation of chips, the EyeQ4, in 2018. Mobileye also intends to launch 15 autonomous driving projects in 2018, across 14 car manufacturers, compared to six in 2017. Intel and its subsidiary Mobileye are partnering with state-owned Chinese automaker SAIC Motor Corporation Ltd. to develop autonomous vehicles, Intel CEO Brian Krzanich announced Monday in the opening keynote speech for the 2018 Consumer Electronics Show, held in Las Vegas. As part of the collaboration, SAIC will develop autonomous vehicles based on Mobileye's technology in China. Intel will also collaborate with SAIC and NavInfo Co. Ltd., one of China's largest mapping companies, to extend its crowdsourced map building to the country. Called Road Experience Management (REM) and launched in 2016, the technology uses camera-equipped vehicles as agents that harvest local geographical data in real time. The data is transmitted to a map aggregating server, which then passes the integrated map information, called a roadbook, to autonomous vehicles using Mobileye's technology. Nissan Motor Co., BMW AG, and Volkswagen AG have already signed agreements with Mobileye to collect driving data from their vehicles if those are equipped with Mobileye chips. The partnerships have been underway before Intel completed its $15.3 billion acquisition of Jerusalem-based Mobileye in August 2017. In his speech, Mr. Krzanich announced that the three automakers will start to deploy the REM technology in their vehicles this year, and consequently, 2 million vehicles will start collecting data for Mobileye's maps throughout 2018. “Data is going to introduce social and economic changes that we see perhaps once or twice in a century,” Mr. Krzanich said. “We not only find data everywhere today, but it will be the creative force behind the innovations of the future." 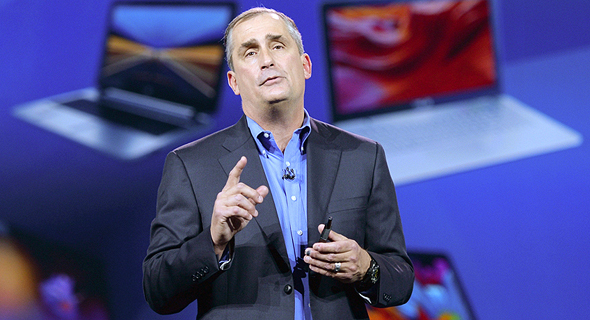 During the show, Mr. Krzanich also unveiled Intel’s first autonomous vehicle in its 100-car test fleet. Mobileye has been testing semi-autonomous cars on public roads in Israel for the past year. On Friday, Mobileye announced an agreement with Spain's Directorate General of Traffic to collaborate on preparing Spain’s infrastructure ecosystem and regulatory policy for the driving of autonomous vehicles. As part of the partnership, Mobileye will also collect road data in Spain.